Le Curvy Kitten: Build me up, Buttercup! Made In Preston's lovely lace creation! Build me up, Buttercup! Made In Preston's lovely lace creation! I was recently contacted by Nikki Hesford of UK booby fashion brand Made In Preston asking if I'd like to review one of their products. Firstly, let's discuss the brand in question. 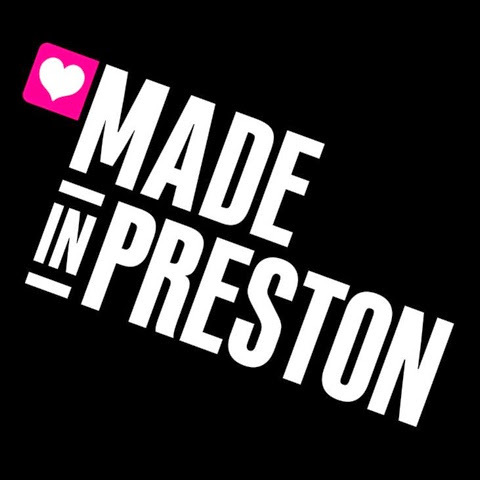 Made in Preston was launched in June 2013 as a fashion house catering for larger cup sizes. "So what's new about that? We have BiuBiu, Saint Bustier, Pepperberry, Urkye and DDAtelier amongst others" I hear you cry! Well, let me tell you, none of those have real edgy catwalk fashion, which is why ex glamour model and young mum Nikki decided to pursue her dream of owning her very own label. The fact that Made in Preston takes inspiration from the catwalk really sets them aside from other bigger bust brands meaning younger women aren't tied down to squeezing themselves into dresses and tops that don't fit from high street stores, boring (but admittedly very useful) 'classics' and often styles that aren't age appropriate for the wearer. The other thing I love about Made In Preston is that, as their name suggests, everything they make is manufactured in Preston, and that can only be a good thing for the local and national economy. Not only do Made In Preston produce clothes for the bigger bust, they also do a range of funky lingerie, of which I'm excited to be reviewing today! Nikki has designed the lingerie in order to stand out, and boy does it do its job! With neon patterned lace fabrics, and blah blah blaaaaahhhhh, you'll be sure to find something for your more adventurous side at Made In Preston! Within a few days my bra arrived, wrapped up lovingly in branded tissue paper with heart stickers to secure. I'm a sucker for nice packaging, it really feels like you're getting a gift and therefore makes it easier to justify the odd splurge on yourself.... Well that's what I tell myself anyway! On opening the package, I found Nikki had very kindly sent me this awesome buttercup yellow unpadded bra (currently at £34, matching knickers £10) in a 28H. As you may know from my previous post on the Cleo Marcie Babydoll, my boyfriend is a HUGE fan of anything yellow, so he was pretty happy Nikki chose this for me! The shade of yellow leans slightly more towards neon/green tones than the Marcie, which I would call a true buttercup yellow. I don't tend to wear unpadded bras for anything other than dossing around the house, so I was slightly apprehensive about trialling the bra. On fitting the bra I noticed the band is nice and snug, like a true 28" should be. I'm currently measuring 27" so this is perfect. In fact it's by far the best 28" band I own. I also notice that it gives a rounded shape, not dissimilar to my all time favourite, the Deco by Freya, only without the epic cleavage, which is a good thing if you like the rounded shape but don't fancy having a cleavage for whatever reason. I normally wear a 28GG Deco and this is a 28H so bear this in mind when ordering. The bra has a black lining with a yellow lace overlay meaning that if, like me, lace makes you itch, the lining prevents this happening. My only criticisms are that the band only has a row of two hooks where I'm used to having three, although admittedly this doesn't appear to have made much difference with regards to support, although it might with a larger band and cup size due to the weight of the bust. What I have noticed is that the band rides up a little, so I don't know whether that could be to do with it not being wide enough or if I need to use the tighter hooks. Also the straps are a touch too thin for my liking, again not what I'm used to in bras with larger cups. Having worn the bra for a couple of days I'm happy to report that I'm very fond of it! Like I said, I'm not a fan of padded bras and avoid wearing them wherever possible but this wonderful yellow creation will be one I hope to get more use out of. This style of bra also comes in Monochrome, Powder Pink and Black and can be purchased here. I love it when lingerie is available in traditionally feminine colours like pinks and yellows.The Made in Preston Buttercup Yellow Lace Non Padded Bra and matching Buttercup Yellow Lace Knickers look lovely. The Cleo by Panache Marcie Babydoll you showcased in your earlier post is lovely too. It's encouraging to see a woman like Nikki Preston designing and manufacturing her couture right there in the U.K.. Her lingerie looks very pretty being modeled by you.